Earlier this year, we reviewed a fantastic app called Meet Science: Magnetism and Electricity. Comprehensive and interactive, it had animated lessons, quizzes, experiment videos, and even mini games. It was was like having an encyclopedia on your iPad. The good news? The app is only the first of a series of apps to help kids discover the amazing world of science. A second app has now been released, and it’s called Meet Science: Light and Sound. The app is divided into several sections: Learn, Experiments, Mini Games, and Glossary. 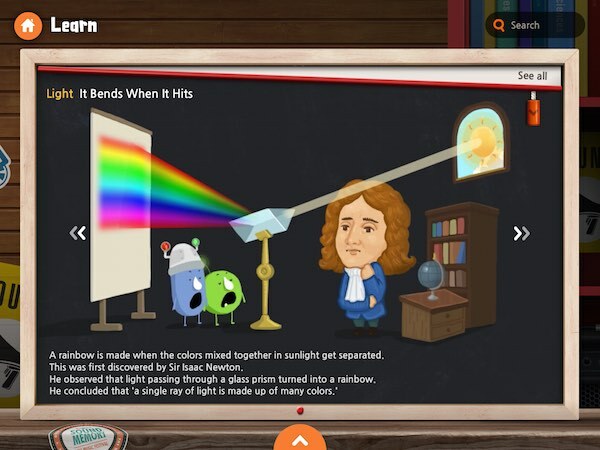 Learn is the textbook section of the app, where kids explore six lessons that cover the fundamental concepts of light and sound. Kids will learn, for example, about how light travels in a straight path, how frequency affects pitch, and how light and sound are alike in many ways. 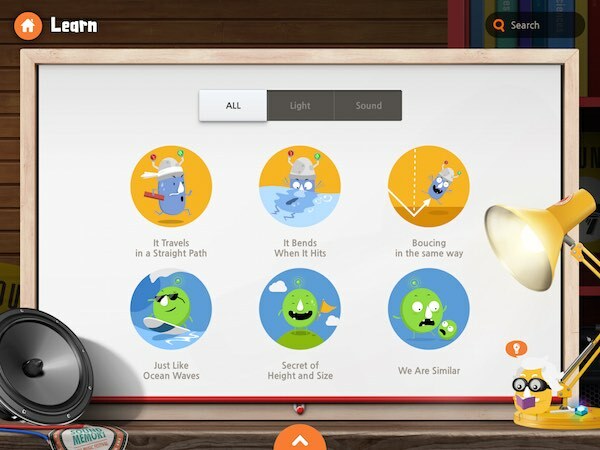 Each lesson comes with colorful animations and is fully narrated. At the end of each lesson, kids may review what they have learned through O/X and word quizzes. The app evaluates each answer on the spot then provides a quick summary to reinforce the lesson. Each video includes all the necessary components and steps. At the last step, the video will pause briefly and ask the viewers to guess the result of the experiment. At the bottom of the video, kids will find a transcript of the narration. They’ll also find summary notes so they can replicate the experiment with help from adults. The Mini Games section contains three mini games related to the concepts of light and sound. A leaderboard records the high scores for each game, encouraging kids to replay it. In Point-N-Shoot Waves, kids must match the frequency of the shell and the wave aliens to defeat the aliens. They tap on the high or low buttons to change the frequency, then hit the Shoot button to hit the alien. The second game is called Mix-n-Match Colors. Here, kids must mix and match the three primary colors and choose the right spotlight shape for the performers on stage. The last game, Reflect-N-Collect Lights, requires kids to pass the light from the mole’s safety helmet to the flower to make it bloom. Using various lenses, they reflect the light at different points until it reaches the flower. Also included is an extensive glossary, which contains interesting information about many physical terms and prominent scientists. 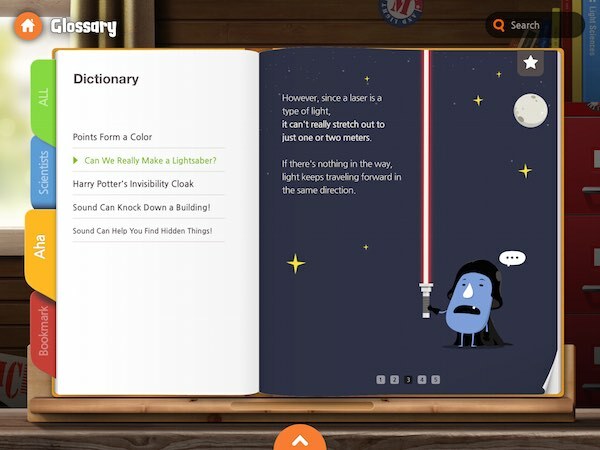 Some glossary cards are more in-depth than others as they cover topics like sonar and recreating Harry Potter’s Invisibility Cloak. You can bookmark your favorite glossary cards for easy access later, or jump to a specific one using the search feature. All glossary cards have images and animations on them. They are also fully narrated. Meet Science: Light and Sound is designed for kids ages 9-11. The inclusion of experiments make it suitable for classroom usage but it also works great at home. We recommend that parents accompany their children, especially when they are performing the experiments. Other than that, the app is quite straightforward. Audio narration is available alongside the text in all sections. The app has no third-party ads and in-app purchases. External links are hidden in a protected section for parents. Meet Science: Light and Sound is truly a comprehensive app — forget an encylopedia, it’s almost like having a portable science museum! There’s lots to discover in the app, from refraction to lightsabers, so it is sure to keep your kids busy for a while. The design of the app also makes it fun to learn. Reading a textbook can be tedious but the silly animations keep the learning experience lively and engaging. By including both text and audio narration, the app also caters to different learning styles. It’s unfortunate that it is only available in English for now, as I’m sure many kids would benefit from it. A comprehensive app to learn the fundamental concepts of light and sound, complete with interactive animations and audio narration. After reviewing the facts, kids can reinforce what they have the learned through quizzes, mini games, and experiment videos. A vast glossary is included for looking up various physical terms. Recommended for grade school-aged kids.